I did my very first Top 10 Tracks of the Year-sorta list a week ago and now it's time to do the harder Top 10 Albums of 2014 list. Harder? Yeah, 'cause there were just too many good ones this year and even now I am regretting leaving off a couple of things you might be able to guess if you peruse my reviews from earlier in the summer. That's okay. I cheated. The number of ties ought to show you how much I cheated but I really had no choice. Okay so here is my Top 10 Albums of 2014 list. That there are actually more than that here should tell you how much I genuinely loved these records and how determined I was to get all of these releases onto this list. The album that every Manics fan was waiting for was this one. Somehow the Welsh legends pulled off the impossible by sounding as on fire as they did 20 years ago. Channeling the punk-inspired rage that fueled their best and brainiest Richey era songs, they honored the missing Manic's memory with an album every bit as dense as his most cherished work with the band. From the Mr. Edwards references in "Walk Me to the Bridge" to the twists and turns of the hooks of "Let's Go To War", the many joys of Futurology have been written about endlessly since its July release. You can analyse this one 100 different ways but one thing is clear: it's the most direct and immediately affecting Manic Street Preachers album in almost a decade. 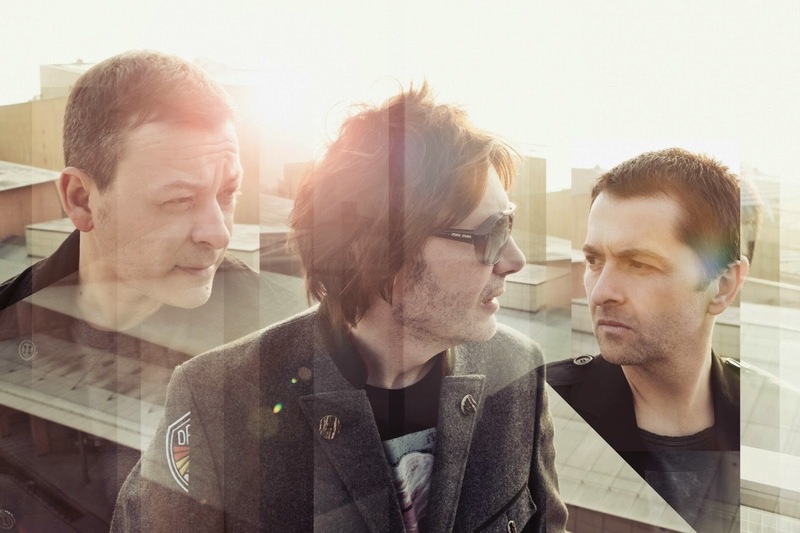 James Dean Bradfield, Nicky Wire, and Sean Moore have cranked out another masterpiece with this one. After blogging about these cats for more than 2 years I can only say one negative thing about their debut full-length album Lacuna and that is...I wished they hadn't re-recorded "Blue Velvet" and made a new video for it too. But, heck, it's still downright magnificent and moving. And guess what? Every cut on this record is. Mashing together the ghost of the most memorable A.R. Kane cuts with the best bits of Ride only without the moments of guitar overkill, Childhood managed to produce something that feels wildly expansive while remaining concise and focused. And that is a supremely hard thing to do. Ask The Stone Roses. If, like Brown and the boys, Childhood are one-trick ponies who can never top Lacuna I don't care. I've been listening to The Stone Roses for 25 years and I guess with tracks like "Solemn Skies" and "Falls Away" on it I can assume that I'll be listening to Lacuna for years to come too. Rips from Mary Timony and Ex Hex is a strange beast. Wildly catchy and yet abrasive, the record shouldn't work but it does. Spectacularly. Engineered by the legendary Mitch Easter (producer on the next Dot Dash record, btw), Rips is a clean album that winks knowingly back at stuff like Rick Springfield and Pat Benatar while updating that style for a new century. How can something with the punch of a Dischord record sound as clean as a Journey hit and be so good? This is how. The biggest surprise of the year is probably just how damn catchy the tunes on this one were. Connections toured with Ex Hex this year and I sincerely hope that the band gathered loads of new fans. It was damn depressing when I first heard of this band and noticed that their Facebook page had less than 1,000 "likes" but things are different now. Into Sixes is the supremely worthy heir to the stuff Pollard did with early line-ups of Guided by Voices. Connections really delivered on this one and, if hard pressed, I may rate this one higher than their earlier releases but all of their stuff is great. Spin "Aylia" for a taste of the hard power-punk of Ohio's Connections. Jack Cooper was an extremely busy boy in 2014. That's sort of why I had to feature both bands he's in on my list. The sound of Mazes and Ultimate Painting is not too far off but there are marked differences. Wooden Aquarium featured marvelous music that owed a debt to stuff like the music of The Feelies and The Dream Syndicate. Still, that's not to peg this as a revivalist act. No, these are vital, vibrant tunes that build upon the successes of past bands. Spin "Universal Me" and hear a trace of stuff like Camper Van Beethoven filtered through a modern sensibility. There is focus here that was lacking in that earlier group. And then after all the many successes of the Mazes record, Cooper one-upped himself when he teamed up with Veronica Falls' Jack Hoare to form Ultimate Painting. Their sublime self-titled debut owed more of an obvious debt to earlier acts, specifically stuff like The Velvet Underground and The Feelies (again) but the tunes were strong enough to succeed on their own even if you didn't know anything from those older bands. Spin "Ten Street" and search your brain for the precursors of this wonderful sound. How can something sound so good and not be some long-lost outtake from The Velvet Underground album? Was there any way that this wasn't going to be on here? Wild Onion from Chicago's Twin Peaks was more than a dozen fantastic cuts asking to be thrown onto a mix CD next to The Strokes, Richard Hell, Television, and The Replacements. Still, it was the moments of Malkmus-like genius that charmed me after I rocked out with the harder songs on the record. Watch the video of "Makin' Breakfast" below and thank your god of choice that a band like this exists in 2014. Wildly catchy tunes and a bunch of American smartasses goofing off? Yes please! I haven't been this happy since I saw the "Gold Soundz" video for the first time back in 1995. Criminally underrated songwriter Martin Newell trotted out the Cleaners from Venus name to release one of the overlooked gems of 2014. Return to Bohemia was English whimsy done right. Fans of Robyn Hitchock and XTC should take this one to heart in a big way. Whether you only know one previous release from Newell or a dozen, Return to Bohemia was a splendid return to form, to use a ridiculously overused phrase. Doubt me? Spin the achingly beautiful "Imaginary Seas" and get back to me. If you ever wondered what The Move would have sounded like had they recorded something with McCartney in the mid-Sixties, here's your lovely answer. I'm happy to be highlighting something that I consider as good as The Go-Betweens that features someone I used to sell Go-Betweens records to. Little did I know in 1988 or 1989 that Pam Berry would have a future as part of the legendary Black Tambourine, even though future Velocity Girl whiz-kid Archie Moore eventually brought in the first Slumberland Records piece of vinyl to show off to those of us working in the University of Maryland Record Co-Op in late 1989/early 1990. But I remember Berry as one of the kids who bought the good stuff from our record bins. Customers like her gave me hope that I wasn't the only guy in the Maryland area that knew who Forster and McLennan were. And, truth be told, I may like Pam's work here on this album even more than I do her work in Black Tambourine or Glo-Worm (with future Dot Dash main-man Terry Banks). But Withered Hand is mainly Dan Wilson and not just a bunch of superstar helpers. He deserves all the credit for making this such a worthy heir to The Go-Betweens and their sort of pop. Wilson put together a stable of key players to join him this time out and his New Gods is a near-masterpiece as a result of that. Buoyed by the strength of singles like "Black Tambourine" and "Horseshoe", this album broke through in a big way in 2014. Music like this is to be applauded and celebrated. Dan Wilson, Berry, Eugene Kelly from The Vaselines, and everyone else who appears on this marvelous record should be wallowing in all the praise they can get. Thanks for making some of my favorite songs of 2014 guys and gals! It seems like I've known these songs for ages. And I have 'cause I started blogging about some of them in 2012. The debut full-length record from Temples finally dropped in 2014 and the wait was worth it. Sun Structures was magical and transcendent. The band managed to produce something like the "greatest hits" of 10 different bands. Lyrical, trippy, and a mind-blower, Sun Structures only begs one question: "Where can these guys possibly go after this?" Throwing Muses rewarded fans in early 2014. The wildly ambitious book/album project of Kristin Hersh and her team needs to be on many "best of" lists this year. What other band would attempt something like this? There were 2 CDs of music, downloads, a book, and a commentary track. The exquisite package of Purgatory/Paradise also gave me a chance to wax lyrical about this band in my very personal review earlier in the year. Hearing Purgatory/Paradise boom over the balcony of my old apartment on Lamma Island as I looked out to the South China Sea is one of my favorite moments of the last few months of my life in Hong Kong. Was there any possible way that I could have narrowed my choice down to only 1 Super Furry Animals spin-off record in 2014? Nope. With leader Gruff Rhys off making highly acclaimed solo albums, and keyboard wizard Cian Ciaran running Strangetown Records and promoting his own wonderful 2013 solo album, it was up to the other 3 Furries to dazzle listeners in 2014. And they did. Drummer Daf teamed up with the guitarist of Catatonia and powerhouse vocalist Dionne Bennett to become The Earth. Their 2014 release, Keltic Voodoo Boogaloo, was unlike anything else I heard this year. A stirring mix of psychedelia and soul -- those vocals! -- The Earth's album was an instant classic crammed with ace tunes. SFA guitarist Bunf took his band, The Pale Blue Dots, into sort of familiar territory with equally splendid results. While there were cuts on Lots of Dots that sounded like Super Furry Animals there were new textures and new expanses of melody. And what of bassist Guto? His Gulp released one of the gems of the summer of 2014 in Season Sun, all warm electronica and subtly sinister and soothing vocals from Jackie Leven.